Beat in the egg and egg yolk, then the corn syrup. Mix well, scraping down the sides as you go. Next add the vanilla and mix well. Add the chocolate chips and beat until just incorporated. Using a medium cookie scoop (I use my trusty Pampered Chef scoops) scoop dough onto lined baking sheet about 1 inch apart and bake for 9 - 12 minutes depending on if you like chewy or crispy cookies. I have a hard time mastering cookies too! I want to try these, my chocolate chip cookie recipe is soso. Thanks for hosting, Michelle - have a great day! These cookies look incredible! I could devour a whole batch right now. They look delicious! 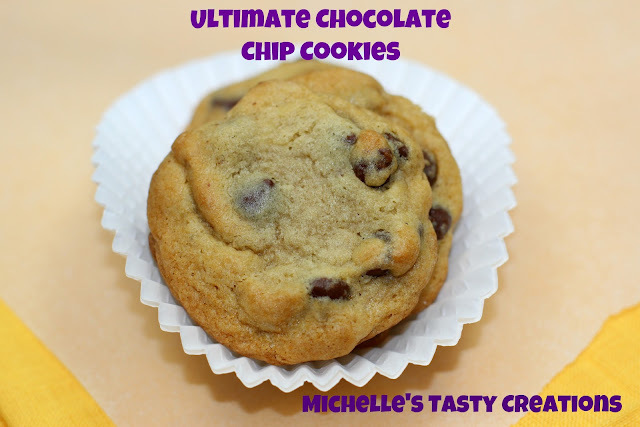 Can you believe that I've actually never baked chocolate chip cookies so I'm going to try these!